Text description provided by the architects. Tetris Extension in Melbourne’s inner north-west is a compact addition completed in early 2018. The clients, a young couple with two small children, had outgrown their neat Californian bungalow and needed more room to move. Crosshatch was engaged to create a sympathetic yet efficient rear extension to meet the family’s needs, while still retaining the much-loved character of the original two-bedroom home. The existing floor plan was also reconfigured to provide a third bedroom, additional bathroom and central lounge. The simplicity of the resulting extension belies a high level of complexity and multi- functionalism that considers every aspect of the site and its surrounds. Crosshatch’s most compelling articulation is the efficient use of 45 square metres of additional floor space to comfortably accommodate a new kitchen, dining area and laundry. Capturing northern light was a priority for the south-facing extension. This was achieved with the introduction of a central courtyard and strategically positioned windows. The extension appears much bigger than it actually is, due in no small part to the interior’s minimalist arrangement, even light penetration and strong relationship to the outdoors. Bringing the outside in was important to both the clients and Crosshatch Co-founders Jaime Diaz-Berrio and Mark Allan and it’s made possible through the dining area’s large picture window with deep reveals and bi-fold glass doors that open to the central courtyard. This active green space connects old and new and extends the living areas beyond their boundaries, creating a sense of spaciousness. The design also allows for visual connection between spaces, so the parents always have a clear view of the children from the kitchen, whether they’re playing in their bedroom, the lounge room, courtyard or backyard. The forms of the new extension are arranged in a tetris-like configuration, expressed in the plan, elevation and section. The interlocking volumes unite the form and function of the old and new. The tetris concept is further iterated through the interior detailing, including bespoke cabinetry and custom kitchen door handles. 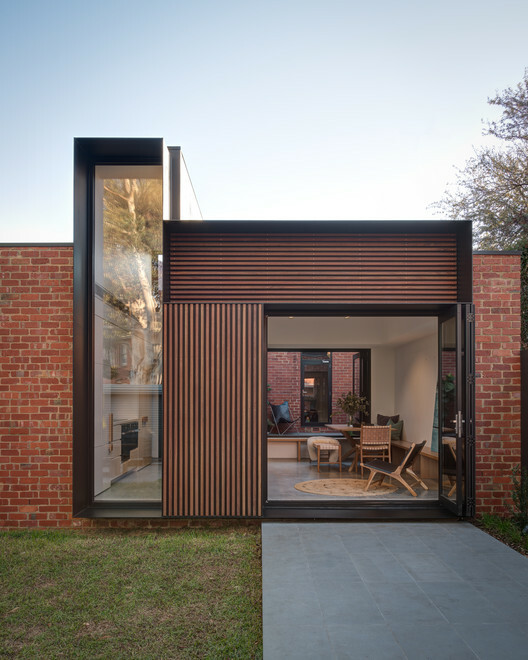 The striking 4.5m high window articulates the exterior and frames the large gum tree on the rear property, sensitively grounding the extension and existing home within its suburban context. Recycled red brick was used to respect the home’s original material palette, in keeping with the area’s Heritage Overlay. Every design decision, from the smallest interior detail to the exterior’s overall form, has been carefully considered to achieve a convincing approach to small footprint modern living.